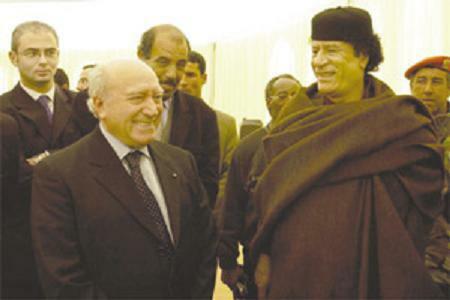 Prof de Marco with Libyan leader Muammar Gaddafi in Sirte in 2004. Former Libyan ambassador to Malta Saad Elshlmani has paid tribute to former President and Foreign Minister Guido de Marco, saying he was always "more than just a friend." Dr Saad Elshlmani, who was ambassador between 2004 and 2008 - the period immediately after Malta joined the EU - said the news of Prof de Marco's demise had been received with shock and great sadness. "As a former ambassador to Malta for my country Libya, I felt the loss of a great friend. During my term in Malta I found in Dr de Marco all the qualities of a statesman who, with all sense of seriousness served his country to have good neighbourly relations with all countries and a big advocate of Mediterranean cooperation and good neighborhood. "On a personal level he was more than just a friend, a big brother who kept strong contact with our then small diplomatic corp., with all his counsel and advice. "For My country Libya and the main Arab cause of occupied Palestine he always kept his sympathy and support and championship, and people in the Middle East will remember him for his great attachment to the issues of tolerance, cooperation and friendship," the former ambassador said. US Ambassador Douglas Kmiec paid tribute to Prof de Marco yesterday. "His tenure as President of the United Nations General Assembly, and his skill and perseverance in guiding Malta to EU membership are great tributes to his statesmanship," he said in a statement.